The Hell Is A Webkinz? (PR) (Trenton, NJ) The Trenton Thunder, Double A affiliate of the New York Yankees, announced on Thursday that 20 additional entrance giveaways, along with several other promotions, have been added to the 2010 promotional schedule. The newly announced giveaways and promotions are in addition to the lineup of “Daily Promotions” that were announced last month and include: Kids Eat Free Mondays, $1 Dog Tuesdays, Wacky Wednesdays, Thirsty Thursdays, Family Fun Fridays, Fireworks Spectacular Saturdays and Kids Rule Sundays. Traditionally popular giveaways such as Thunder hats (June 4 thanks to RAI), fielding gloves (August 4 thanks to Rosenberger’s Dairies) baseballs (June 16) and card sets (June 25 thanks to Verizon Wireless) are all included on the schedule in addition to the previously announced bobblehead series and fireworks dates. Fans will find many new items being given away at the entrances to Waterfront Park this season including on College Night on April 22. The first 1,000 fans ages 18 and over will receive a T-Shirt modeled after the shirt made famous by John Belushi in the film Animal House featuring simply the word “College” and a Thunder logo. Mother’s Day will be celebrated at two games this year. On Saturday, May 8, the first 2,000 women ages 18 and over will receive a Pink Thunder Luggage Tag thanks to Stone Mountain Accessories. Sunday, May 9 will feature a Trenton Thunder visor giveaway for the first 1,000 women ages 18+ thanks to Monday Morning Flowers and the Chauncey Conference Center. On Sunday, June 6, the first 1,000 fans ages 5-15 will receive the hottest toy on the market today – a Webkinz plush toy. When the planet is in the midst of World Cup Soccer action, the team will give away Thunder soccer balls to the first 1,000 fans ages 5-15. The US team plays its first match on June 12 and this giveaway will be on Sunday, June 13. Thunder themed beach towels will be given to fans just in time for summer as the first 1,000 ages 18 and older to enter the ballpark will receive one on June 15 thanks to Arm & Hammer. The first 1,000 fans ages 5-15 on June 27 will receive a drawstring backpack resembling a Trenton Thunder jersey courtesy of Capital Health. Comic book collectors won’t want to miss the games on August 15 and 17 when the first 1,500 fans will receive a baseball themed comic with a custom designed Trenton Thunder cover. The same comic book will be given away at both games. The team will wear special jerseys at two games this season starting with a special “Turn Forward The Clock Game” on April 24 when Portland is visiting. Both teams will wear the uniforms of their Major League affiliates to create a future Yankees vs. future Red Sox game at Waterfront Park. The Thunder will once again wear “Irish” themed jerseys at the annual Irish American Night on July 26. The Irish jerseys will be auctioned off during the game. As previously announced, the Thunder will host 20 fireworks shows and will give away bobblehead dolls featuring the likeness of former players at seven games this season. Additional promotions include Baseball Bingo at every Tuesday game and the Sunday Fun Run presented by TD Bank following every Sunday afternoon game. Distribution of promotional items is for fans in attendance only. Promotion dates, items and distribution are subject to change and/or cancellation. All Trenton Thunder tickets, including Mini Plans, Season Tickets, Group Outings and Luxury Suites are on sale now at trentonthunder.com or by calling 609-394-3300. Trenton begins its 2010 season by hosting the Erie Sea Wolves (double-A affiliate of the Detroit Tigers) on Thursday, April 8. Game time is set for 7:05 p.m.
Before 2009: Jose Molina played 16 professional seasons before 2009. You don’t care what he did in them, right? Either that, or you know already. Came up with the Cubs, spent six and a half seasons with the Angels and won a World Series, came to the Yankees in 2007, etc. 2009: Molina entered the season as the clear backup to Jorge Posada…he exited it having had one of his worst years in the big leagues, but he also ended up with his second World Series ring. Somewhere inbetween, he injured his quad and was scheduled for a rehab assignment with Triple-A Scranton in early July. He played in two games with Scranton before their field turned into a quagmire (giggidy!) and he was re-routed to Trenton for the final three games of his five-game minor league stint. Said rehab assignment entailed a riveting 0-for-7 line over the course of three games, complete with two walks and four strikeouts. He didn’t look ready for a big league return, and he certainly wasn’t running like a guy ready to play in the big leagues…but he left and never looked back. After 2009: Molina talked when he said he was going to talk, and that was about the extent of it…he wasn’t willing to do pre-game interviews, which was a bit surprising. Not surprising was that nobody from the New York media came down to cover the three-game stay at Waterfront Park, as Molina is hardly a big name. He wasn’t bad to deal with, just wasn’t the most accomodating, either. The emergence of Francisco Cervelli, combined with another off year at the plate for Molina, led to Molina’s contract not being renewed for the 2010 season. Instead, he had to scramble to find a job this February, catching on with the Toronto Blue Jays. Before 2009: Mendoza enjoyed a 12-year professional career, and he spent the first six seasons of it in the San Francisco Giants organization, topping out with a brief stint in Triple-A in 2003. 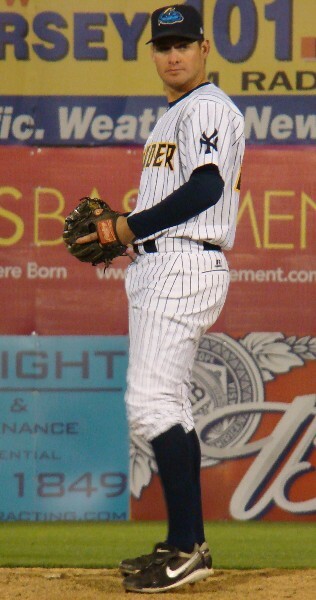 After playing with Pensacola in an independent league for two and a half seasons, Mendoza was picked up by the Yankees midway through the 2006 season and was assigned to High-A Tampa. He spent all of 2007 with the Thunder, and played in 84 games en route to helping Trenton win their first Eastern League championship. While he was used substantially less in 2008 (30 games) and was frequently put on the phantom DL, his numbers improved and he was a valuable component of the bench in the Thunder’s second of back-to-back championships. 2009: Mendoza started the season in Double-A Trenton, and was somewhat surprisingly summoned to Triple-A Scranton approximately two weeks into the season. He played three games in his first call-up to Triple-A in five years, and would appear in eight games with Trenton as well. In 356 at-bats with the Thunder, Mendoza was never able to hit a home run…but he did manage to make an appearance on the mound in May. After 2009: First and foremost, Mendoza was an absolute pleasure to cover. I can’t even begin to count how many times I had to ask him to translate interviews for me with Spanish-speaking players, and he’d always do it without complaining. Guys like that are simply invaluable to reporters, and he’d often go out of his way to help me. On the field, I think his contributions were overlooked…he was a very solid, capable infielder who was always solid whenever he was asked to play. He was a good influence on the younger Latin players as well, and the fact that his locker was near theirs was likely not a coincidence. Following his unofficial retirement of sorts last season, where he joined Staten Island’s coaching staff in 2009, he’ll spend 2010 as the Charleston Riverdogs first base coach. Before 2009: Mendoza had zero prior experience as a pitcher. 2009: In his 12th, and ultimately final, professional season, Carlos Mendoza made his debut on the pitcher’s mound in a May 12th blowout against the Portland Sea Dogs. Following the ejection of manager Tony Franklin, Mendoza came off the bench to serve as first base coach, since Vic Valencia had to take over as acting manager. As the game continued to get out of hand, everyone’s favorite reliever, Noel Castillo, took over in the ninth inning. He faced a grand total of four batters, allowing one hit and three walks…somewhere in the middle of that disaster, Mendoza sprinted to the bullpen and quickly got loose. With the bases loaded and nobody out, Mendy came into the game. Five pitches and three outs later, and his debut was a successful one. In typical Mendoza fashion, he downplayed his contributions after the game. “I think I did OK, I got three outs,” he joked. After 2009: Mendoza played his last professional game on June 2nd, and became a coach for Short Season-A Staten Island. This season, he’ll serve as Charleston’s first base coach. (NYY PR) The New York Yankees announced today that they have invited five additional players to Major League spring training. The club has now invited 25 non-roster players to 2010 Spring Training in Tampa, Fla., including 13 pitchers, five catchers, two infielders and five outfielders. The total number of players now scheduled to report is 65. INF Brandon Laird, 22, hit .266 (120-for-451) with 20 doubles, 13 home runs and 75 RBI in a career-high 124 games with Single-A Tampa in 2009, tying for third among all Yankees minor leaguers and leading the Florida State League in RBI. Following the season, played with the Surprise Rafters and was named to the Arizona Fall League Top Prospects Team. Laird was originally selected by the Yankees in the 27th round of the 2007 First-Year Player Draft. He is the brother of Detroit Tigers catcher Gerald Laird. RHP D.J. Mitchell, 22, made his professional debut in 2009, combining to go 12-7 with a 2.63 ERA in 25 appearances (24 starts) with Single-A Charleston and Single-A Tampa. Among all Yankees minor leaguers, ranked second in strikeouts (125), tied for second in wins and ranked fourth in ERA. Mitchell was selected by the Yankees in the 10th round of the 2008 First-Year Player Draft and is attending his first spring camp. RHP Dustin Moseley, 28, made three starts with Los Angeles-AL in 2009, going 1-0 with a 4.30 ERA, before being placed on the disabled list in April with right forearm tightness. He also underwent arthroscopic surgery on his left hip in August. In 64 career appearances (23 starts)—all with the Angels—has gone 8-7 with a 5.41 ERA. Moseley was originally selected by Cincinnati in Compensation Round A (34th overall) of the 2000 First-Year Player Draft. RHP Ryan Pope, 23, spent the 2009 season with Double-A Trenton, going 5-12 with a 4.78 ERA in 26 appearances (25 starts) and striking out 106 batters with only 34 walks. Pope was selected by the Yankees in the third round of the 2007 First-Year Player Draft, becoming the first player ever drafted out of the Savannah College of Art and Design. INF Jorge Vazquez, 27, was a 10-year veteran of the Mexican League prior to signing with the Yankees in December 2008. He made his Double-A debut in 2009, batting .329 with 13 home runs and 56 RBI in 57 games for Trenton before missing the final two months of the season on the disabled list with a left wrist sprain. He played for Team Mexico in the 2009 World Baseball Classic prior to the season, batting .294 (5-for-17) with one home run and five RBI in five games. 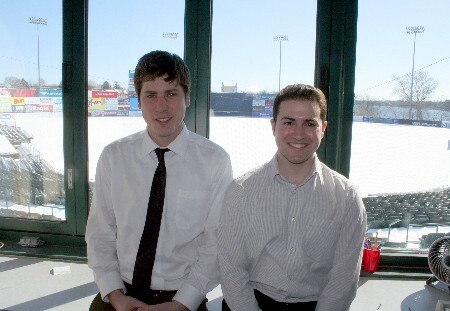 (PR) (Trenton, NJ) The Trenton Thunder, the double-A affiliate of the New York Yankees, announced today that Jay Burnham and Justin Shackil have been named the radio broadcast team for the 2010 season. All games will be aired on flagship station WRRC, 107.7 FM “The Bronc”, for the second consecutive season. Burnham, a Shelburne Falls, MA native, has been named the new Director of Broadcasting and Shackil (Wayne, NJ) the new Broadcast and Media Relations Assistant. Burnham enters his eighth season in baseball broadcasting in 2010. He served as the Director of Broadcasting for the Asheville Tourists of the South Atlantic League the past two seasons. Burnham, 28, joined the Tourists for the 2007 season after holding the same position with the Pensacola Pelicans in the American Association for three years. Burnham is a 2004 graduate of Elon University in North Carolina. Shackil is a 2009 graduate of Fordham University in the Bronx, NY. The 23-year-old has announced games for all Fordham sports, and was part of the radio broadcast team for the 2009 US Tennis Open on USOpen.org. This will be his second season in professional baseball broadcasting. Shackil called games for the Gateway Grizzlies of the Frontier League in 2008. Burnham will replace Steve Rudenstein, who served as the Director of Broadcasting for the last two seasons. Rudenstein, who played a part on Thunder broadcasts for parts of six seasons, departed from Trenton to pursue another career opportunity. For the second consecutive season, WRRC 107.7 FM will be the flagship station for Thunder baseball, carrying all 142 games and playoffs. WRRC is the Rider University student station and plays a variety of music including: Top 40, adult hits, and the oldies. It is also the flagship station for Rider University men’s and women’s basketball. In addition, WIFI 1460 AM of Burlington County, NJ will air a select amount of games in 2010. All games can be heard on www.trentonthunder.com. The Thunder recently announced a schedule of daily promotions that will occur throughout the season. These include: Kids Eat Free Mondays, $1 Dog Tuesdays, Wacky Wednesdays, Thirsty Thursdays, Family Fun Fridays, Fireworks Spectacular Saturdays and Kids Rule Sundays. More details can be found on trentonthunder.com. Before 2009: Malec was drafted in the 16th tound of the 2005 draft by the Yankees. Assigned to the Gulf Coast League after signing, he raked to the tune of a .384 average in 21 games. The following season, he was assigned to Low-A Charleston and earned a call-up to High-A Tampa after just a month and a half after hitting .262 with a home run and 14 RBI for the Riverdogs. But when he got to Tampa, he struggled, and hit just .205 over the last three and a half months of his second professional season. But Malec recovered beautifully in 2007, starting the season in Charleston and earning another call-up to Tampa midway through the year. He hit .308 in Charleston and .323 in Tampa, and ended the season on Trenton’s playoff roster, although he didn’t play. 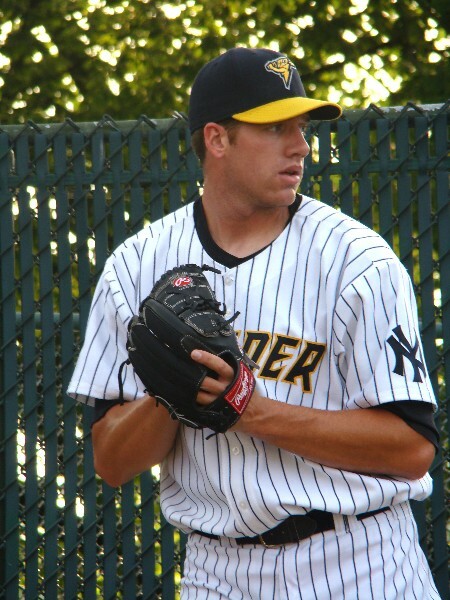 He did spend all of 2008 in Trenton, however, and he quickly emerged as one of the most consistent hitters and a team leader after starting the season on the bench. He earned an All-Star selection in a season where he hit .291 with five home runs and 52 RBI, and also played a big role in helping the Thunder win their second consecutive championship. 2009: Malec got off to a hot start in Trenton last year, and was quickly sent to Triple-A Scranton. However, after hitting .226 in 19 games, he was shipped back to Trenton for the remainder of the season. While he played well — hitting .279 with eight home runs and 56 RBI — he wasn’t quite as good as he was for the Thunder in 2008. His 68:57 BB/K ratio in ’08 was pretty hard to replicate, and his 42:63 mark last season showed that. Not bad, but consider the drop in average and that, and he dropped off just a bit. After 2009: How can you not root for Chris Malec? Even aside of everything he’s been through — which, out of respect for him, I’ve never brought up with him — he’s a good story and a great guy. He’s also a “go-to guy” for the media after games, which…if you do what I do, means a lot. Basically, win or loss, you know he’ll also be willing to talk and give you more than the usual cliche crap. Malec will most likely start his 2010 season in Triple-A Scranton. I would imagine his days in Trenton are through, but you can never be sure. He didn’t perform particularly well in his call-up last year, and it’s hard to picture him in an everyday role up there…which he’s most likely earned, by now. At 27 years old, Malec has absolutely got to make something happen. There’s no getting around that. Before 2009: Krum was drafted in the 9th round in 2007 by the Yankees out of noted baseball powerhouse Dallas Baptist University. Assigned to Short Season-A Staten Island after signing, he got off to a somewhat lackluster start, hitting just .238 in 60 games, adding one home run, 22 RBI and 11 stolen bases along the way. 2009: Krum started the season in High-A Tampa and lasted about two months before ultimately being called up to Trenton. In Tampa, he hit .272 in 53 games, but hit no home runs and drove in only 14. His 77-game stay in Trenton…it would be harsh to call it disappointing, but he stood out more for his unexpectedly strong arm than anything he did at the plate. He hit only .234 and added only two home runs and 24 RBI. After 2009: It’s hard to know what to make of Krum after just two and a half professional seasons. As of right now, I’d say he’s got a decent bat with below average power and average speed. Probably above average in the field, with the occasional errant throw mixed in. I’d think it’s pretty much a lock that he starts 2010 in Trenton, and may spend the majority of the season here, if not all of it. It’s probably a little much to say 2010 is a make or break year for the friendly outfielder, but at 24 years old, he needs to start making some progress in his game to have a real chance to progress to Triple-A and possibly the big leagues. (Yankees PR) Marcus Thames, 32, was originally selected by the Yankees in the 30th round of the 1996 First-Year Player Draft. He owns a .243 career batting average with 75 doubles, 101 home runs and 261 RBI in 522 Major League games over parts of eight seasons with the Yankees, Texas Rangers and Detroit Tigers. Since 2006, he has averaged one home run every 14.52 at-bats, marking the fourth-lowest ratio in the American League over the stretch (min. 1,100 AB). Thames batted .252 with 11 doubles, 13 home runs and 36 RBI in 87 games with the Tigers in 2009, missing nearly two months (April 19-June 7) on the disabled list with a left rib cage strain. LHP Wilkins Arias, 29, spent the 2009 season with Double-A Trenton, going 5-4 with a 3.65 ERA in 48 appearances (two starts) and holding left-handed batters to a .183 (20-for-109) batting average with one home run. Arias was originally signed by the Yankees as a non-drafted free agent in June 2005. LHP Jeremy Bleich, 22, combined to go 9-10 with a 4.86 ERA in 27 starts with Single-A Tampa and Double-A Trenton in 2009. 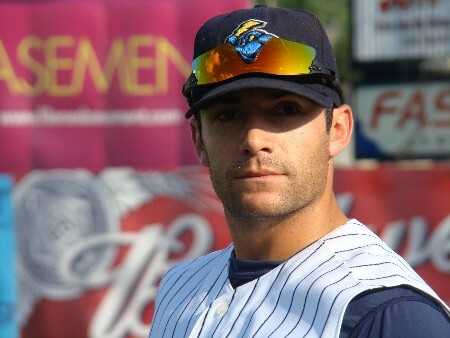 Bleich enters the 2010 season ranked by Baseball America as the organization’s ninth-best prospect after recording the fifth-most strikeouts (116) among all Yankees minor leaguers in 2009. The Louisiana native was originally selected by the Yankees in Compensation Round A (44th overall) of the 2008 First-Year Player Draft. OF Colin Curtis, 24, appeared in 126 games with Double-A Trenton and Triple-A Scranton/Wilkes-Barre in 2009, combining to bat .250 with seven home runs, 48 RBI and a career-high 24 doubles. Curtis was originally selected by the Yankees in the fourth round of the 2006 First-Year Player Draft out of Arizona State University. RHP Grant Duff, 27, combined to go 4-3 with two saves and a 3.52 ERA in 45 appearances (one start) with Single-A Tampa and Double-A Trenton in 2009. The right-hander was selected by the Yankees in the 31st round of the 2004 First-Year Player Draft out of the College of the Sequoias in Visalia, Calif.
OF Reid Gorecki, 29, saw his first Major League action in 2009, batting .200 in 31 games with Atlanta. Also spent time with Triple-A Gwinnett, batting .286 with 27 doubles, nine home runs and 49 RBI in 106 games, setting a career high in doubles. Gorecki was originally selected by St. Louis in the 13th round of the 2002 First-Year Player Draft. C Kyle Higashioka, 19, batted .253 with 11 doubles, two home runs and 32 RBI in 60 games with short-season Single-A Staten Island in 2009, leading all New York-Penn League catchers in games caught (57), total chances (497) and putouts (451). His 25.3 percent caught stealing rate (19-for-75) ranked fifth in the league. Originally selected by the Yankees in the seventh round of the 2008 First-Year Player Draft, Higashioka will be the youngest player in the team’s spring training camp. RHP Jason Hirsh, 27, owns an 8-11 career record with a 5.32 ERA in 32 appearances (29 starts) over parts of three Major League seasons with Houston (2006) and Colorado (2007-08). In 2009, he combined to go 10-7 with a 5.55 ERA in 26 appearances (22 starts) with Triple-A Colorado Springs and Triple-A Scranton/Wilkes-Barre. Following a mid-season trade to the Yankees on July 29, 2009, he went undefeated in six starts with Scranton/WB, going 4-0 with a 1.35 ERA. Hirsh was originally selected by Houston in the second round of the 2003 First-Year Player Draft. LHP Kei Igawa, 30, led Triple-A Scranton/Wilkes-Barre in both wins and games started, going 10-8 with a 4.15 ERA in 26 starts. With 29 career wins at the Triple-A level, the lefthander now holds the record for most victories in Scranton/WB history. Igawa was originally acquired by the Yankees through the Japanese posting process in November 2007 and owns a 2-4 record with a 6.66 ERA in 16 Major League games (13 starts). RHP Zach McAllister, 22, went 7-5 with an Eastern League-leading 2.23 ERA in 22 starts with Double-A Trenton in 2009, ranking second among Yankees minor leaguers in ERA. Originally selected by the Yankees in the third round of the 2006 First-Year Player Draft, he enters 2010 ranked by Baseball America as the Yankees’ fifth-best prospect and as having the “Best Control” in the organization. C Jesus Montero, 20, combined to bat .337 with 45 runs, 25 doubles, 17 home runs and 70 RBI in 92 games with Single-A Tampa and Double-A Trenton in 2009, ranking fourth among all Yankees minor leaguers in home runs. Named to the midseason All-Star teams with both Tampa and Trenton, he had his season cut short when he was hit by a pitch while behind the plate on 8/1, fracturing his middle finger. Originally signed by the Yankees as a non-drafted free agent in October 2006, the Venezuela native, played for the World Team in the 2009 All-Star Futures Game at St. Louis’ Busch Stadium. 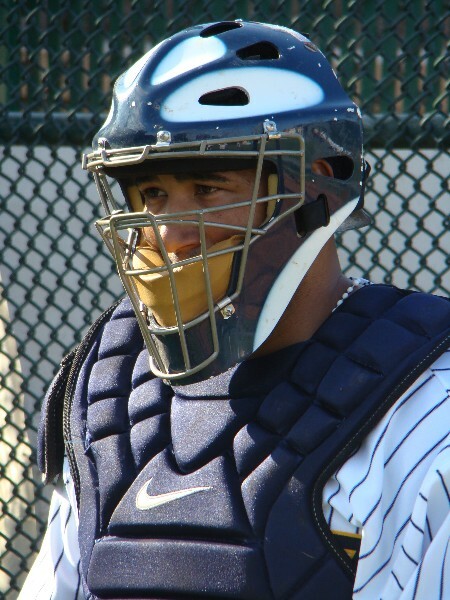 He enters the 2010 season ranked by Baseball America as the Yankees’ top prospect and the fifth-best prospect in all of Baseball (top catcher). C P.J. Pilittere, 28, combined to hit .220 with one home run and 17 RBI in 55 games with Triple-A Scranton/Wilkes-Barre and Double-A Trenton in 2009. Originally selected by the Yankees in the 13th round of the 2004 First-Year Player Draft, Pilittere will be making his fourth straight spring training appearance after receiving non-roster invitations each year since 2007. LHP Royce Ring, 29, spent the 2009 season with Triple-A Memphis, going 5-2 with four saves and a 3.04 ERA in 51 relief outings. In 94 relief appearances, he owns a 3-3 record with a 4.93 ERA over parts of four Major League seasons with the Mets (2005-06), San Diego (2007) and Atlanta (2007-08), holding left-handed batters to a .229 (30-for-131) batting average. Ring was originally selected by Chicago-AL as the 18th overall pick in the first round of the 2002 First-Year Player Draft. C Mike Rivera, 33, owns a .244 (129-for-528) career batting average with 13 home runs and 69 RBI in 181 Major League games over parts of seven seasons with Detroit (2001-02), San Diego (2003) and Milwaukee (2006-09). He hit .228 with two home runs and 14 RBI in 41 games with the Brewers in 2009, making 31 starts at catcher. Rivera was originally signed by the Detroit Tigers as a non-drafted free agent in 1997. 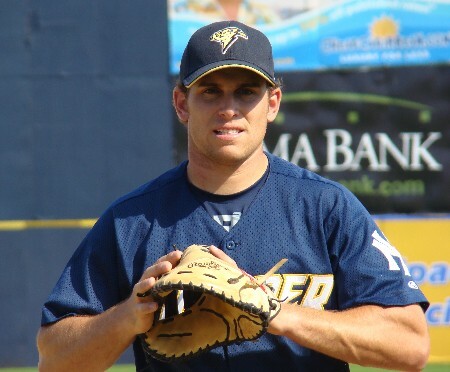 C Austin Romine, 21, was selected by the Yankees in the second round of the 2007 First-Year Player Draft out of El Toro High School in California and will be making his third consecutive appearance as a spring training non-roster invitee. He batted .276 with 61 runs, 28 doubles, 13 home runs and 72 RBI in 118 games with Single-A Tampa in 2009, tying his career high in hits and establishing career highs in doubles and RBI. Following the season, Romine was tabbed by Baseball America as the second-best prospect in the Yankees organization. He was selected by the Yankees in the second round of the 2007 First-Year Player Draft. RHP Amaury Sanit, 30, went 1-5 with 10 saves and a 3.16 ERA in 44 combined relief outings with Single-A Tampa, Double-A Trenton and Triple-A Scranton/Wilkes-Barre in 2009. Sanit was originally signed by the Yankees as a non-drafted free agent in August 2008. RHP Zack Segovia, 26, went 1-0 with a 7.84 ERA in eight relief appearances with the Washington Nationals in 2009. He also saw time at the minor league level, combining to go 3-5 with six saves and a 3.24 ERA in 51 appearances (three starts) with Double-A Harrisburg and Triple-A Syracuse. Segovia was originally selected by the Phillies in the second round of the 2002 First-Year Player Draft. OF Jon Weber, 31, hit .302 with 14 home runs and 69 RBI in 117 games with Triple-A Durham in 2009, leading the team in hits (136) and doubles (46) and ranking third in runs scored (63) and RBI. 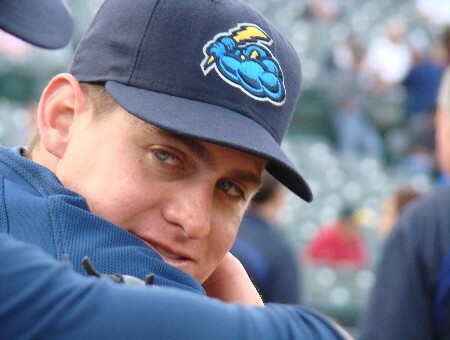 Originally signed by Cincinnati as a non-drafted free agent in 1999, Weber spent the last two seasons in the Tampa Bay Rays organization. RHP Kevin Whelan, 26, combined to go 4-0 with three saves and a 2.67 ERA in 44 relief appearances with Double-A Trenton and Triple-A Scranton/Wilkes-Barre in 2009, allowing just one home run in 67.1 IP. Whelan was acquired by the Yankees with RHPs Humberto Sanchez and Anthony Claggett from Detroit in exchange for OF Gary Sheffield in November 2006. He was originally drafted by the Tigers in the fourth round of the 2005 First-Year Player Draft. OF David Winfree, 24, batted .273 with 48 runs, 14 home runs, 61 RBI and a career-high-tying 31 doubles in 116 games with Triple-A Rochester in 2009, leading the team in doubles, ranking second in home runs and RBI and third in hits. Winfree was originally selected by the Twins in the 13th round of the 2003 First-Year Player Draft.